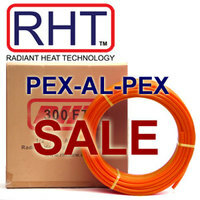 RHT PEX-AL-PEX is a multi-layered oxygen barrier tubing ideal for all radiant heating applications. The inside and outside layers are made of high-density polyethylene (HDPE) cross-linked (PEX) which is smooth, toxin-free and hygienic. These layers are tightly bonded with adhesive to the middle layer of aluminum which is 100 percent gas/oxygen tight. The aluminum layer is longitudinally welded in an overlapping manner and all layers are extruded in one step. The pex and aluminum layers combine to create flexible, rust-free tubing that will not corrode, stays in place when bent and expands less than regular pex or copper. For 3/8", 1/2", 5/8", 3/4" & 1"